ClaroLux’s CL-SWL1-III Specialty Wash Light is a great way to illuminate driveways and pathways where traditional path lights cannot be used for fear they would be knocked over. The patented CL-SWL1-III is constructed from solid cast brass. 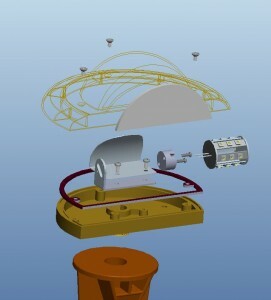 This enables the CL-SWL1-III to be placed where most conventional area lights cannot. If you are in search of a low profile path/area light that is discrete yet gives you a nice light output then this is the light for you. When ClaroLux designed the SWL1-III, it wanted to make a light that was not only functional but very versatile. This fixture has many different options and features which makes it one of ClaroLux’s best selling fixtures because it can be used in many different settings. The SWL1-III Specialty Wash Light can not only be used to illuminate ground areas but can also be surface mounted on docks, decks, rock walls, etc. Simply remove the ground stake from the fixture and the light becomes a great wall washer. The fixture is also completely water tight so there is no need to worry about water entering the fixture and ruining your LEDs or other internal components. 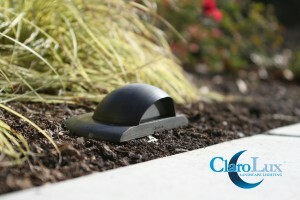 This is just one more “first” that ClaroLux has brought to the landscape lighting industry. ClaroLux is setting the standard and helping our customers to create lasting outdoor lighting masterpieces. Call today to see how ClaroLux can help to transform your business. Equipped with a slight overhang which prevents light glare. 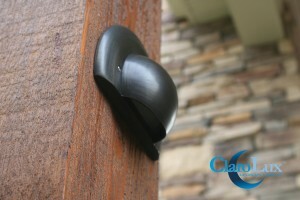 Can be mounted on the ground or surface mounted to a deck, dock, or wall structure. Manufactured with a frosted glass lens which helps to give you that nice, soft, even light output. With the Brilliance LED Two-Wire, Low-Voltage AC Dimmer, you can blend safe-to-the-touch 12 VAC with the superior illumination qualities of low-voltage lighting in new and innovative ways to dim your lighting. No longer do you have to use a separate low voltage transformer with an inline 120V dimmer to dim your landscape lighting system. The Brilliance LED 12V AC Dimmer can operate inline with any of your low voltage wires. One scenario where the Brilliance AC Dimmer Switch works great is when you are only needing to dim a few lights on a large lighting system. In this case, what you would do is simply wire that particular section into a standard outlet box. Then install the Brilliance LED Dimmer switch into the outlet box and as easy as that…those lights are now dimmable. There are some limitations to this switch, so please know the limits of the switch before installing one of these on your landscape lighting projects. If you are installing a LED landscape lighting system and only wishing to dim a few lights, make sure that those LED fixtures add up to more than 1 amp/12W (the minimum rating for this switch to operate properly). If you fail to meet the minimum load/wattage then when you try to dim those particular LEDs your lights will flash. So make sure you are pulling more than 1 Amp (12 watts) when installing one of these switches. If you are above the switches minimum rating, the innovative “pi” trigger circuit delivers flicker-free, wide-band dimming performance — from warm glow through full-spectrum brightness. Triac-based power circuitry coupled by a low-firing point diac further minimizes waste heat and maximizes efficiency and brightness. A quality machined aluminum knob adds elegance and value to the installation. Rotary action is crisp and smooth, while a tactile off position reduces power drain to zero when inactive. An improved response curve allows better control over the important low brightness range. 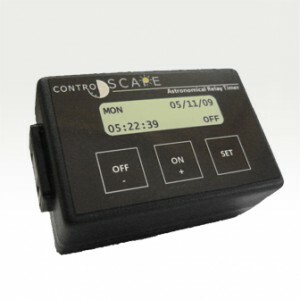 You can even optimize minimum brightness “on the fly” via an included adjustment potentiometer to compensate for low or high AC source voltage, or to create some special effect. Soft start/end extend the life of expensive bulbs. A heavy RF noise filter delivering about 10 times the suppression of an ordinary filter attenuates interference with nearby radios and other electronic appliances to the nil-to-none range. Each Dimmer comes complete and ready-to-install with wiring harness, tagged leads, and detailed installation instructions. The standard switch plate is metal (Cobalt Blue). 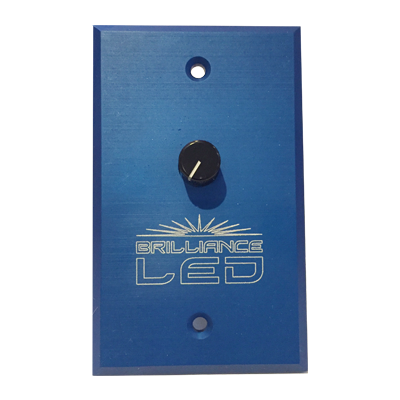 The Brilliance LED 12 volt Dimmer Switch is a must when customizing your landscape lighting system!